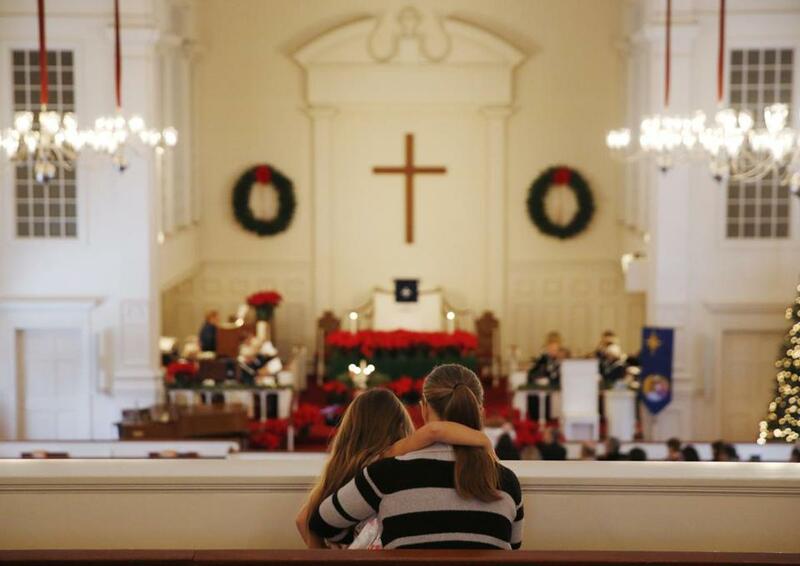 Amy Moore and her daughter, Samantha, 6, sat in the balcony for a service at The Plymouth Church in Framingham. FRAMINGHAM — The Rev. Gregory Morisse stepped up to the pulpit. It was five days after Election Day, and just before Advent, the season of preparation for Christmas. He looked out over the sanctuary of The Plymouth Church in Framingham, its tall, arched windows letting in morning light. The church is affiliated with the liberal United Church of Christ, but he knew his congregation had diverse political views. He hadn’t talked about the election from the pulpit. Until now. His message was stark: President-elect Donald Trump, he declared, had “appealed to the worst in America.” Inexplicably, he said, it was white Christians who had brought this “deplorable” man to power. Now, they had to “wake up,” for they had work to do: They must stand with the downtrodden and the marginalized. Pat McFerrin, the church treasurer, got up from his usual seat partway through and walked out. Rebecca Reiner, the stewardship council chairwoman and a Hillary Clinton supporter, exchanged wide eyes with a conservative-leaning friend sitting nearby. In the back pew, Glenn Pruszinski felt, for the first time since the election, a surge of hope. In the days that followed, that pushback would change Plymouth Church, forcing the 175 or so active members and their pastor to confront difficult questions: What should they do when the powerful forces dividing the nation showed up in their sanctuary? In this season of waiting, what did their faith require of them? How much disagreement was too much? Morisse, a vivacious and musical 38-year-old pastor who has served Plymouth Church his whole career, had spent the days after the election taking calls from members distressed about the results. Even so, he was prepared for the minority who wanted Trump to win to disagree with his sermon. McFerrin, a retired Raytheon engineer and a Republican, did not like Trump’s coarse manner, but he’d appreciated the real estate mogul’s business experience, and Trump was offering change. There was no way he could back Clinton, whom he viewed as corrupt. Trump was not, in McFerrin’s view, a racist, as he’d been portrayed. What he told Morisse: I thought that sermon was inappropriate. Politics, he added later, do not belong in church — especially not in a sermon, where the conversation was a one-way street. Reiner, a nonprofit fund-raiser with two young children, felt torn. She could not understand how a country that had paid so much attention to bullying in schools would choose “the biggest bully in the room” as president. The Rev. Gregory Morisse’s sermon against President-elect Donald Trump after the Nov. 8 vote led to hurt feelings and division in his Framingham church. So Reiner agreed with the central message of Morisse’s sermon. But his tone rattled her, and some of his words alienated people she loved. “It sounded like that e-mail you write when you’re really angry, but that you don’t send,” she said. That afternoon, Reiner took a phone call from a friend in tears, who told her some mutual friends felt stung by the sermon. The next day, a family e-mailed to rescind their annual pledge; they wouldn’t be back. Reiner responded with a heartfelt note saying she was sorry they felt unwelcome. The night he gave the sermon, Morisse sent an e-mail to the congregation acknowledging the controversy but professing his love and respect for everyone in the church. The Leadership Council scheduled a forum to discuss Morisse’s sermon the next Sunday. They expected the few families who strongly disagreed with the sermon to show up. To their surprise, about 65 people did, representing a wide range of viewpoints. What happened next was, in this age of poisonous polarization, a minor miracle: For two full hours, they talked about their reaction to the sermon. They did not shout. They did not interrupt. Nobody stormed out. They spoke, and they listened to one another. Mary Whittemore, another longtime member and a Clinton supporter, was struck by the sincerity in the room. “What they had to express was heartfelt and genuine and important to them,” she said. Listening stoked her curiosity, not just for deeper conversation across political lines with people she had known for years, but about her own convictions. Louise Savary, a longtime member who voted for Trump, had felt wounded by the pastor’s incendiary sermon. Afterward, he had told her he saw everyone as a child of God. It didn’t feel like that, she replied. Yet she was comforted when Morisse said he wished he hadn’t called Trump “deplorable,” a word Clinton used to describe the half of Trump supporters who she said were bigoted — a charged word, one woman said, she would prefer to never hear again. And Morisse apologized for referring to Trump supporters as if “they” were an undifferentiated mass, and somehow outside the congregation. Reiner, though, can’t forget that some of the people hurt most weren’t part of the conversation — they didn’t want to come back. She misses them. Her kids wonder where their playmates have gone. The dialogue, for some, complicated relationships even as it deepened them. Pruszinski, a member of the governing council and a congregant for 30 years, still finds it baffling that some took offense at Morisse’s words. He realizes now that he did not know some of his fellow members as well as he thought he did. He draws hope from the words the congregation reads when a child is baptized — as it did the last Sunday of Advent, when they welcomed an infant and a 7-year-old girl into Christian life with the sacred rite: We are, by this affirmation, inseparably bound to them. “It turns out we actually have some work to do to make that a reality,” Pruszinski said later. Morisse, for his part, sees the imperfections in his sermon more clearly now. But he meant to provoke conversation and stir his congregation to action. “If I had just preached kumbaya, there wouldn’t have been any scratchy urgency to speak,” he said. He is saddened that three families have not been back, and may be gone permanently. And he knows this may not be the last hard conversation about public life. The church, he says, must continue to protect the vulnerable, whoever is in power. “If Trump and his administration continue to take such bold stances, I suspect I will find myself again struggling in the murkiness of politics and partisanship,” he said in an e-mail. Last Sunday, Christmas was the focus. 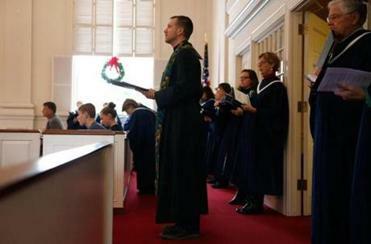 A profusion of poinsettias decorated the altar, the children’s “cherub” choir sang, and after church, people lingered over coffee and trays of Christmas cookies. Morisse’s sermon that day was about the harsh circumstances in which, according to Christian scripture, Jesus entered the world.